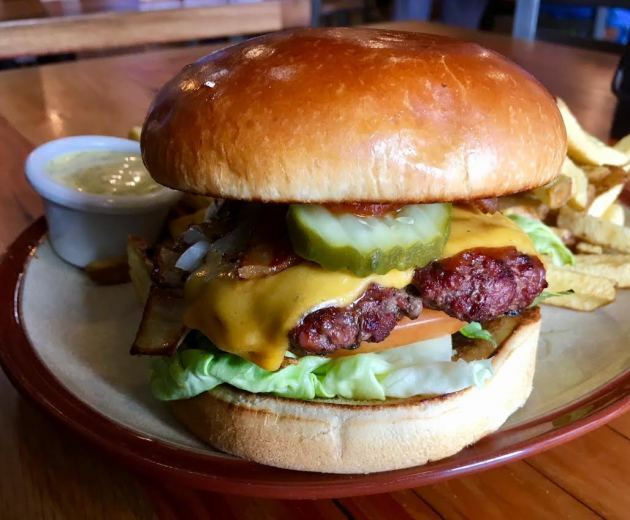 The burger: Pardon me for eavesdropping, but I couldn’t help but be impressed by the generous and genuine endorsement from my OMC Smokehouse server. He was talking to the folks at the table to my right, and they were quizzing him on various menu items. 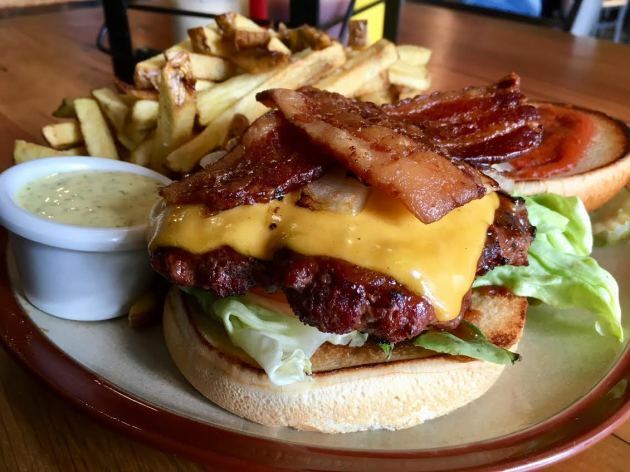 "You have to order the burger," he said. "It's so good that, the first time I had it, I knew I had to get a job here." Sold. And, lesson learned, because there are benefits to ordering a burger at a barbecue joint. Namely, the kitchen’s obsessions with beef and smoke. Contrary to the diner-style burger movement, where thin patties are cooked, skillet-style, on a flat top grill, OMC chef/co-owner Louis Hanson takes full advantage of his oak-burning grill. Grilled burgers have a tendency to dry out – instead of the patties coming to fruition in their own juices, that tasty moisture seeps out (a second negative outcome: that splatter-causing leakage leads to the flare-ups that tend to char the heck out of the beef). But that’s not the case here. Perhaps it’s the patty’s heft – each is a thick half-pounder --- that keeps this burger nice and juicy. Yes, portions of the outer edges attain a pleasant crispness, but it’s not overkill. Even better, the rustic oomph of that oak smoke enhances but doesn't overwhelm the beef's rich flavor. For the bun, Hanson has chosen wisely, a sturdy baked-elsewhere product that’s generously buttered and then toasted to a pleasant crispiness on the grill. It holds up well to the demands placed upon it, which are considerable, without feeling (or tasting) ponderous. Although it would be perfectly acceptable – and delicious – to stop here, Hanson piles on plenty of admirable finishing touches. A criss-cross of chewy, fat-ribbed, thick-cut bacon (more smoky goodness, hurrah) practically constitutes a meal on its own, but also of note is a tangy house-made tomato-onion jam. There’s some smart engineering going on, too, with a few leaves of crispy, juicy lettuce tucked under the patty, a trick that keeps all those juices from turning the bottom bun into mush. My first inclination was to reach for a knife and fork; yeah, this burger’s proportions are on that scale. But then I reminded myself of my surroundings. It’s a barbecue joint. It’s more than OK to make a mess. Price: $14. A gluten-free bun is available for an additional $2. Fries: Not included, but invest in the additional $2. They’re hand-cut, skin-on and fried in beef fat, and they’re terrific. 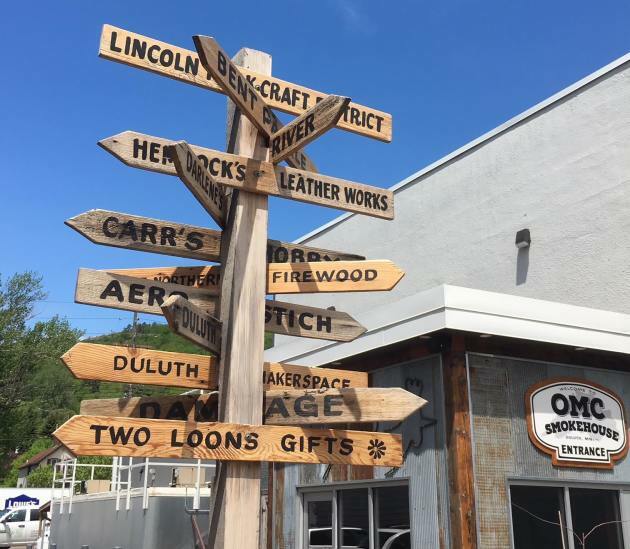 Urban renewal: The restaurant is one of a number of reasons to ignore tourist-filled Canal Park and discover a different, up-and-coming side of Duluth. It’s exciting to watch the rebirth of Lincoln Park, a renaissance fueled, in part, by food and drink. 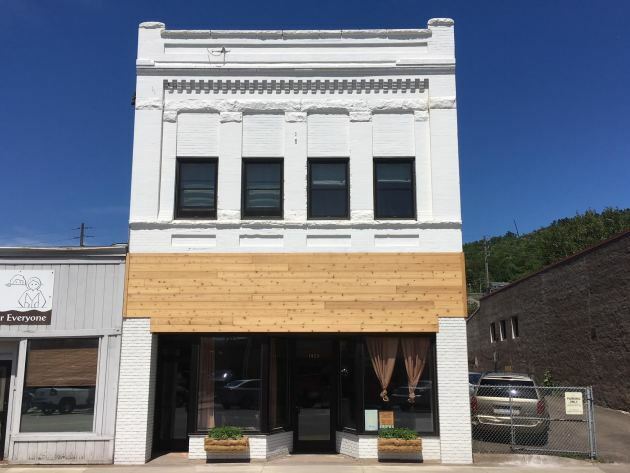 A major attraction to this once frazzled commercial district (“Five years ago, most of these buildings were abandoned or in foreclosure,” said Hanson) is Bent Paddle Brewing Co. (pictured, above) which recently christened one of the state’s most appealing taprooms. It helps that OMC delivers, often via an adorable scooter, although business is already so brisk that Hanson finds himself walking over orders, a lot. “According to the phone in my pocket, I’ve logged six miles in the last three days, just walking back and forth between here and Bent Paddle,” said Hanson with a laugh. Two weeks ago, the Hanson family (parents Tom and Jaima Hanson, their son Louis and his wife Ashley) converted a former pawn shop into a first-rate sandwich-and-beer joint, Corktown Deli & Brews (that's their OMC Smokehouse, above, and its helpful, old-school guide to Lincoln Park attractions). Another must-visit newcomer on the block is Love Creamery, owner Nicole Wilde’s Instagram-bait ice cream shop and espresso counter. Neighborhood pioneer Christian Benson operates his Frost River outfitters next door; it’s one of several highly browsable retailers in the area. Be on the lookout for more newcomers, all opening soon: the Duluth Folk School, which is in the middle of building roomy new quarters (including a cafe); Hotel Pikku, a three-suite boutique hotel (pictured, above); and Ursa Minor Brewing, where brothers Mark and Ben Hugus will also prepare Neapolitan-style pizzas in a wood-burning oven. (For my recent tour through Duluth's dining scene, go here). 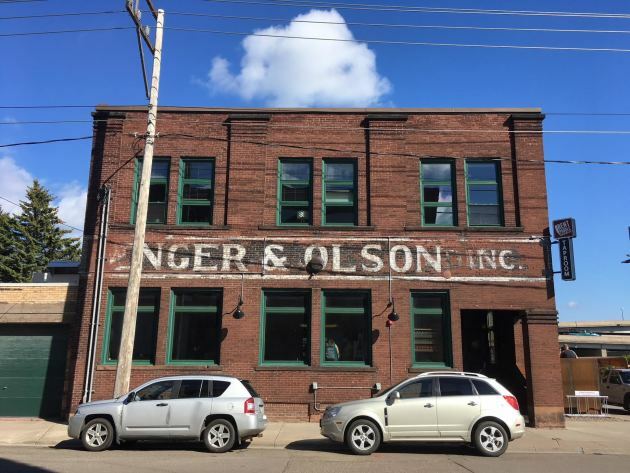 Address book: 1909 W. Superior St., Duluth, 218-606-1611. Open 11 a.m. to 9 p.m. Sunday through Thursday, 11 a.m. to 10 p.m. Friday and Saturday.